Is the 'cash crunch' back, or is everyone worried about nothing? The Chinese central bank is pretty sure it's the latter. As most markets begin to wind down for the holiday season, things in China have just begun to get complicated: the country’s seven-day bond repurchase rate has risen by 60 basis points to 8.8%, suggesting the 'cash crunch' everyone was worried about over the summer has made an unwelcome return. To be fair, strange goings-on have been afoot in China's financial markets for some time. Back in June, the People’s Daily– the Communist Party’s state newspaper – argued that capital market regulation in the world’s second-largest economy is ‘fundamentally flawed’ and that the Shanghai stock market is ‘a creature only capable of gobbling more up, never of discharging anything, and now suffering from an intestinal obstruction’. Ie. Chinese companies are too big to fail, and the government was tired of bailing them out. Weirdly, that was followed more or less immediately by a series of 'liquidity injections' designed to ease conditions on banks. On Friday night, it announced the latest of those: an injection of Rmb300bn of 'short-term liquidity' into cash-strapped banks. But that doesn’t seem to have done much: although the Shanghai Composite rose 0.4% in its morning session, that was only after nine consecutive days of falls, so not much to write home about. The Chinese government has responded by trying to convince everyone that everything’s fine. 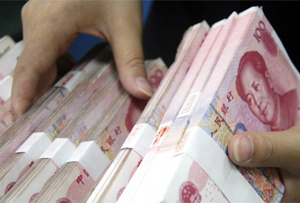 State-owned financial newspaper the Shanghai Securities News argued this morning that ‘the cash crunch is absolutely not a shortage of money. Rather, it results from the distorted funding structure of banks’. Er, ok then. Something like this was always going to happen: at this time of year, businesses in China spend more cash, causing banks to scrabble around for deposits to meet regulatory requirements. And the central bank has pointed out that between them, Chinese banks have Rmb1.5tn of excess reserves. All the need to do, suggested the bank, is to spend some of that cash.